Drought? That never ended for Southern California. Mother Nature has taken some hits and has struck back, despite the floods they could sure use the rain. By this time, Central CA has received 50% of the annual rainfall. So far, we have received 1.64". Saw the report today that says the Sierra snowpack is only 37℅ of normal. I didnt realize NoCal wasnt getting rain and snow eother. Hope the coming rains will help the snow pack. Rains are coming from the southwest; it's bound to be warmer, so I wouldn't hold out much hope for snow, but next week's prediction calls for colder weather, and hopefully, more snow. @No_Such_Reality wrote: Saw the report today that says the Sierra snowpack is only 37℅ of normal. I didnt realize NoCal wasnt getting rain and snow eother. That's double what it was the week before, so we were celebrating that report. Here in Fresno, we received 3" of rain in 3 days. Mother Nature rudely woke me from a late nap with a real thunderstorm downpour of 0.9" in 30+ minutes. Of course I had to grab my iPhone and take some short videos. I would post one but I haven't figured out how to do it. How did you folks in NoCal and SoCal do? It reached 100*F today. Anyone else hit triple digits? The summer and water rationing could be real interesting this summer. At midnight it was a lovely 80*F with a light breeze. @sanderson wrote: It reached 100*F today. Anyone else hit triple digits? The summer and water rationing could be real interesting this summer. At midnight it was a lovely 80*F with a light breeze. Officially, no, but our thermometer said 101 on Monday. Saturday we're supposed to hit 100. The drought monitor still says we're "abnormally dry" and portions of the bottom of the state are still "extreme". The only help we can expect is if some rogue hurricane come inland this summer. I will put a couple of gallons in my dehydrator and mail it to you. I need to save postage. @Kelejan wrote: I will put a couple of gallons in my dehydrator and mail it to you. I need to save postage. 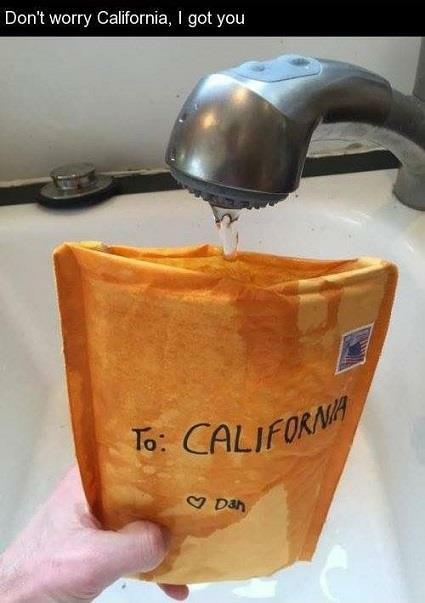 California is going to 55 gallons per day per person. So, laundry (40 gallons) or shower today? @sanderson wrote: California is going to 55 gallons per day per person. So, laundry (40 gallons) or shower today? Well isn't that great! And they won't let us recycle gray water. They're also finicky about trapping rain water and forget damming creeks or even surface water. Wells cost $10k and north and I'm not even sure if can drill them any more. Can you cheat with grey water? Or would someone report you and you get fined or jailed? for your garden; Mulch! Mulch! Mulch! A bit hard to mulch the lawn, I would think. I give up! We were talking about the new water conservation laws in CA, but I can't find it anywhere. Turns out the threat was a hoax. Some clown with a blog said we couldn't shower and do laundry in the same day, and the stupid thing went viral. What I'd like to know is how they can tell which one of us is using the water, and whether we're inside or outside. The shower or laundry topic is based on the fact that a load of laundry is about 40 gallons. What can you get done with the remaining 10-15 gallon allotment for the day. Wash dishes, shower? Water the pot of petunias? Make bone broth? Or, for us, water our food plants? @sanderson wrote: Or, for us, water our food plants? That's the part that doesn't make sense. The guidelines say "inside" use. So, are we getting a 2nd meter? One for "inside" and another one for "outside"? Anyway, the good news is that it's just guidelines for water companies right now, not mandatory rationing for us this year, at least. Move the washing machine and shower outside!! Am I smart or what! @sanderson wrote: Move the washing machine and shower outside!! Am I smart or what! Good thinkin', S. Actually, our washing machine is already outside! Just got back from a drive to Phoenix. I love the drive because it really highlights the power of development and the perpetual water wars. Any way, out in the coachella valley, in the sand dunes of the palm desert, they were harvesting grapes from the new fields they planted next to Interstate 10 about three years ago. Yes, middle of the drought emergency and continuing in SoCals drought, in the middle of literal sand dunes, a vineyard, lush, green, growing and full of fruit at 110 degres Fahrenheit and 8% relative humidty. Roll on, Blythe. Lots of fields next to the river. New palm tree plantafion further inland. New hay fields further still inland. Roll on, Sonoran Desert closing in on Phoenix. On one side of thr road, the desert scrub cattle pasture with the barns barely visible from the freeway. Never seen the cattle from the freeway, except the one slowly skeletonizing carcass. The other side of the freeway, a new waist high field of corn stretching out of sight. Corn, seriously water to grow corn in the desert. Closer to Phoenix still, the usual cotton and other crops that have slowly been expanding. Probably just the moving of the farmers as Phoenix has bought their land for subdivisions. One other item i saw way off the freeway near Palo Verde where large white barn like structures. Not sure what they were but reminded me of chicken barns which were surrounded by green. Again still in the sand of the Sonoran Desert.